This work presents a controlled reduction method for the selective synthesis of different sized gold nanoclusters protected by thiolate (SR = SC2H4Ph). Starting with Au(III) salt, all the syntheses of Au n (SR) m nanoclusters with (n, m) = (20, 16), (24, 20), (39, 29), and (40, 30) necessitate experimental conditions of slow stirring and slow reduction of Au(I) intermediate species. By controlling the reaction kinetics for the reduction of Au(I) into clusters by NaBH4, different sized gold nanoclusters are selectively obtained. Two factors are identified to be important for the selective growth of Au20, Au24, and Au39/40 nanoclusters, including the stirring speed of the Au(I) solution and the NaBH4 addition speed during the step of Au(I) reduction to clusters. When comparing with the synthesis of Au25(SC2H4Ph)18 nanoclusters, we further identified that the reduction degree of Au(I) by NaBH4 also plays an important role in controlling cluster size. Overall, our results demonstrate the feasibility of attaining new sizes of gold nanoclusters via a controlled reduction route. Gold nanoclusters [1–6] have received extensive attention owing to their interesting optical properties [6–9], magnetism [10, 11], fluorescence [12–16], chirality [17–20], redox properties [21–27], as well as potential applications in many fields such as catalysis and biological labeling [28–33]. The new physicochemical properties of gold nanoclusters are largely imparted by the discrete electronic structure of the metal core due to quantum confinement effects. The surface of the cluster may also influence some of the material properties, such as chirality [18, 19]. Recently, major advances in wet chemical synthesis of nanoclusters have been achieved, and it has been possible to control nanoclusters at the atomic level. A number of well-defined nanoclusters have been reported; however, only a few can be obtained in bulk quantities and in high yields via facile synthetic methods . Among the various thiolate-protected gold nanoclusters, Au25(SR)18 has been extensively studied [21–27, 35–41]. Other well-defined nanoclusters have also been attained, such as Au36, Au38[43, 44], Au102, and Au144[46, 47]. We previously reported a kinetically controlled synthetic approach for the synthesis of highly pure Au25(SR)18 nanoclusters [48, 49]. The method involves a size focusing mechanism, that is, the initial cluster product of mixed sizes is converged to a specific size of highest stability under appropriate conditions . By controlling the size range of the initial nanoclusters, one can achieve atomic monidispersity of nanoclusters . This synthetic approach constitutes a versatile strategy for gold nanocluster synthesis  and has been demonstrated in the synthesis of quite a number of atomically precise Au n (SR) m nanoclusters, such as Au25, Au38, and Au144. Herein, we demonstrate that a controlled reduction method can lead to different sizes of gold nanoclusters. By making a modification of the synthetic method of Au24 nanoclusters , we have obtained two new sizes, including Au39(SC2H4Ph)29 and Au40(SC2H4Ph)30. Our results explicitly show that the initial growth stage of nanoclusters is critical and can be largely influenced by experimental conditions. This method of controlled reduction has expanded the synthetic approaches for preparing nanoclusters with size control. The following chemicals were used: tetrachloroauric(III) acid (HAuCl4·3H2O, >99.99 % metals basis, Sigma-Aldrich Corporation, St. Louis, MO, USA), tetraoctylammonium bromide (TOAB, ≥98%, Fluka Chemicals Limited, Gillingham, Medway, UK), phenylethanethiol (PhC2H4SH, 99%, Acros Organics, Thermo Fisher Scientific, NJ, USA), and sodium borohydride (99.99%, metals basis, Sigma-Aldrich). The solvents include toluene (HPLC grade, ≥99.9%, Sigma-Aldrich), ethanol (absolute, 200 proof, PHARMCO-AAPER, Shelbyville, KY, USA). Pure water was from Wahaha Co. LTD (Hangzhou, China). All glassware was thoroughly cleaned with aqua regia (HCl: HNO3 = 3:1 vol), rinsed with copious pure water, and then dried in an oven prior to use. 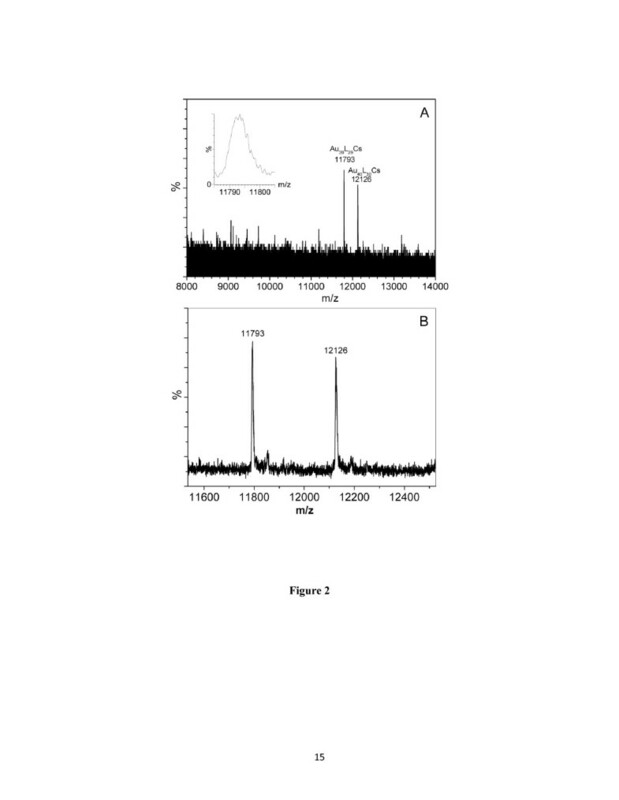 All UV-visible (vis) absorption spectra of Au nanoclusters in either toluene or methylene chloride were recorded using a Hewlett-Packard (HP, Palo Alto, CA, USA) 8453 diode array spectrophotometer. Electrospray ionization mass spectra were acquired using a Waters Q-TOF (Waters Corporation, Milford, MA, USA) mass spectrometer equipped with a Z-spray source. The sample solution (approximately 1 mg/mL) dissolved in toluene was diluted in dry methanol (50 mM cesium acetate CsAc, 1:2 vol). The sample was directly infused at 5 μL/min. The source temperature was kept at 70°C. The spray voltage was kept at 2.20 kV; the cone voltage, at 60 V.
HAuCl4·3H2O (0.1612 g, 0.41 mmol) was dissolved in 5 mL water, and tetraoctylammonium bromide (TOAB, 0.2541 g, 0.465 mmol) was dissolved in 10 mL toluene. These two solutions were combined in a 25-mL tri-neck, round-bottom flask. The solution was vigorously stirred (approximately 1,100 rpm) with a magnetic stir bar to facilitate phase transfer of Au(III) salt into the toluene phase. After approximately 15 min, phase transfer was completed; the clear aqueous phase was then removed. The toluene solution was cooled down to 0 °C in an ice bath over a period of approximately 30 min under constant magnetic stirring. After that, magnetic stirring was reduced to a slow speed (approximately 100 rpm), PhC2H4SH (0.20 mL, approximately threefold the moles of gold) was added, and the solution was kept under slow stirring. The solution color changed slowly from deep red to faint yellow and to colorless over approximately 1 h. After that, the speed of magnetic stirring was increased from approximately 100 to 400 rpm. At the same time, 1 mL aqueous solution of NaBH4 (0.44 mol/L, freshly made with ice-cold water) was dropwise added to the toluene solution over a 15-min period using a 1-mL syringe. The color of the solution turned black gradually. After the dropwise addition of NaBH4, the reaction was allowed to further proceed overnight. The optical absorption spectrum of the crude reaction product (diluted with toluene) shows a distinct absorption band at approximately 800 nm. The aqueous layer at the bottom of the flask was removed using a syringe, and the toluene solution was concentrated by rotary evaporation at room temperature. Ethanol (approximately 50 mL) was added to precipitate the Au nanoclusters. The brown, turbid solution was allowed to stand on bench for several hours. The precipitate was collected and redissolved in toluene. This precipitation/dissolution process was repeated with ethanol. The crude mixture was extracted with methylene chloride/acetonitrile (1:9 vol) to remove a small amount of Au20(SC2H4Ph)16 (its optical absorption band at approximately 485 nm) . After Au20 was removed from the product, Au24(SC2H4Ph)20 nanoclusters were removed by a second extraction with methylene chloride/acetonitrile (1:2 vol) . The final remaining product was collected and characterized by mass spectrometry. Starting with an Au(III) salt precursor, the synthesis of gold nanoclusters involves two primary stages: (a) reduction of Au(III) to Au(I) by HSR, during which the formed Au(I) intermediate species spontaneously aggregates into polymeric Au(I) species (unknown structure), and (b) reduction of Au(I) to Au n (SR) m nanoclusters by NaBH4. In this work, we have identified several important factors for the synthesis of nanoclusters Au39 and Au40, including the stirring speed of the reaction mixture, the addition speed, and the amount of NaBH4 solution to reduce Au(I) into clusters. The synthetic conditions reported in this work differ from the previous syntheses of Au19(SC2H4Ph)13, Au20(SC2H4Ph)16 and Au24(SC2H4Ph)20 (see ‘Methods’ section) [50–52]. Specifically, in the present work, our major modification lies in the stirring speed of the Au(I) intermediate solution when reduced by NaBH4. In a previous work, Au20(SC2H4Ph)16 and Au24(SC2H4Ph)20 were synthesized by controlling the stirring speed for the reduction step of Au(I) by NaBH4; for example, approximately 50 rpm for Au20(SC2H4Ph)16 and approximately 100 rpm for Au24(SC2H4Ph)20. To synthesize larger-sized nanoclusters, we rationalize that the kinetics of the reduction reaction of Au(I) intermediate species by NaBH4 may be important for potential size control. Motivated by that, we systematically varied the synthetic conditions and also compared with the typical method for Au25(SC2H4Ph)18 synthesis. Interestingly, we found that with the stirring speed being increased to approximately 400 rpm, the crude product (Figure 1A) shows an optical spectrum different from that of Au24(SC2H4Ph)20 or Au20(SC2H4Ph)16 (Figure 1B,C). A new absorption peak centered at approximately 800 nm was observed (Figure 1A), indicating that some new species have been formed in this controlled reduction process. 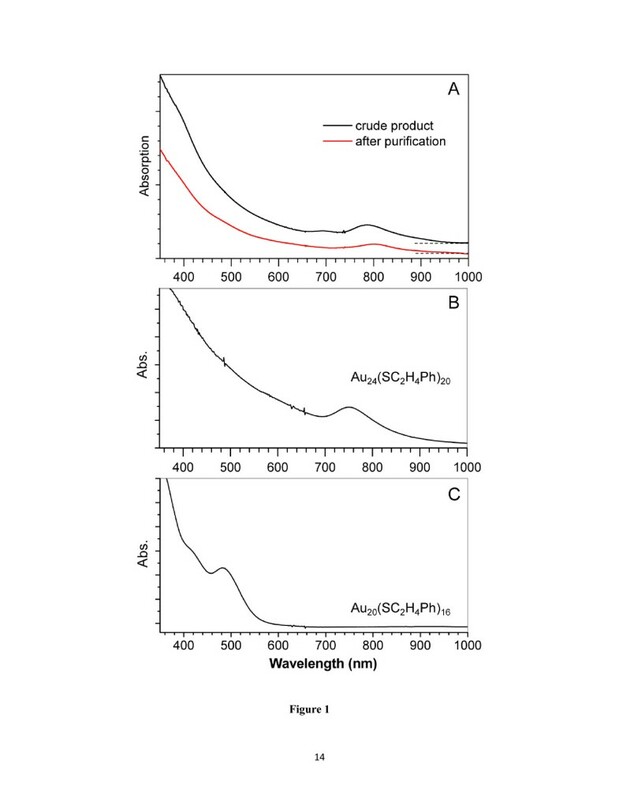 Of note, the small peak at approximately 700 nm (Figure 1A) is due to the concurrent formation of a small amount of Au24(SC2H4Ph)20 clusters as impurities in the synthesis of the new clusters. To remove Au24 and possible Au20 impurities from the product, the clusters in the crude product were precipitated by adding ethanol, and the crude product was then extracted with CH2Cl2/CH3CN (1:9 vol) to selectively dissolve Au20(SC2H4Ph)16 from the product. The remained undissolved produce was followed by a second extraction with CH2Cl2/CH3CN (1:2 vol) to remove Au24(SC2H4Ph)20. 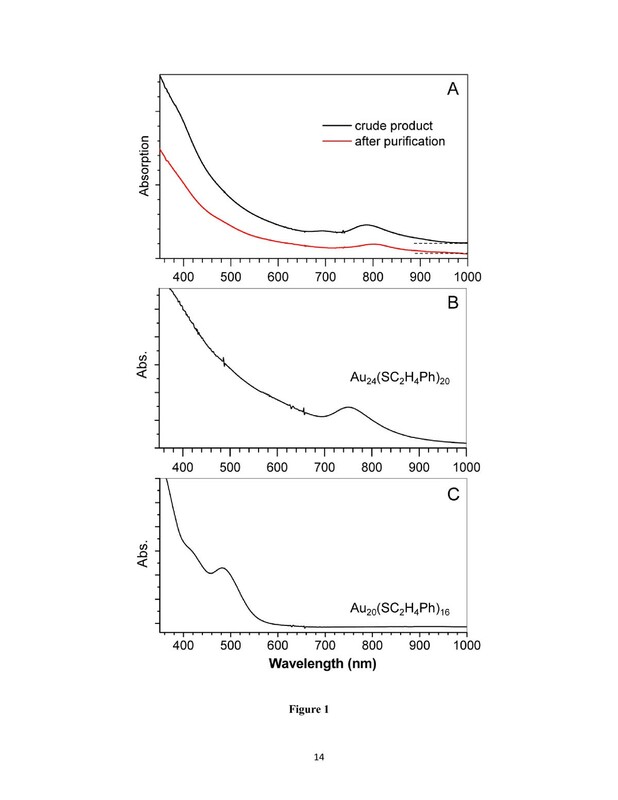 The final remaining product is largely free of Au24 and Au20 impurities, as evidenced in the disappearance of the 700-nm band in the optical spectrum (Figure 1A, red profile). The relatively pure product is subject to further characterization for cluster formula determination. UV-vis absorption spectra. (A) The new cluster product (black profile, crude product without any extraction; red, after two extractions), (B) pure Au24(SC2H4Ph)20, and (C) pure Au20(SC2H4Ph)16. We employ electrospray ionization mass spectrometry (ESI-MS) to determine the composition of the new gold cluster product. A solution of cesium acetate (CsAc, 50 mM, in dry methanol) was added to a toluene solution of gold clusters at 1:1 or 1:2 (vol). ESI-MS detects the cluster-Cs adducts that are positively charged due to Cs+ addition to the cluster surface. The low-mass portion of the spectrum consists of all [CsAc] x Cs+ signals (Figure S1 in Additional file 1), and residual Au24(SC2H4Ph)20Cs was also observed at m/z 7,603 (calculated FW = 7604 for mono-Cs adduct). The high-mass portion (Figure 2) shows two peaks at m/z 11,793 and 12,127 (Figure 2A, unsmoothed spectrum; Figure 2B, smoothed). These two signals are corresponding to the new clusters formed in the controlled reduction process. Both peaks indicate +1 ions, evidenced by the unity spacing of the isotope-resolved peaks (see Figure 2A inset, for m/z 11,793). After subtracting one Cs+ ion (FW = 133), the masses of the two new clusters are determined to be 11,660 and 11,994 Da. Unfortunately, isolation of these two mixed clusters into pure ones has not been successful so far. ESI-MS spectra of the new nanolcusters. (A ) Unsmoothed spectrum in the range of m/z 8,000 to 14,000 (inset, isotope pattern of m/z 11,793) and (B) zoom-in spectrum (smoothed). To deduce the formulas of the two new Au n (SC2H4Ph) m clusters based upon the ESI-MS data, we first determine the minimum value of the gold atom number (n), which corresponds to the limiting case of Au(I):SR complexes, i.e., when n = m. This gives rise to 11,660/337 approximately 35 for the peak of m/z 11,660. We then construct candidate formulas by systematically increasing n starting from 35. For example, for n = 36, we list two closest matches to the ESI-determined mass of 11,660 Da, one with the smallest negative deviation, i.e., (n, m) = (36, 33), and the other with the smallest positive deviation, i.e., (n, m) = (36, 34), see Table 1; note that other m values for n = 36 are not pursued since they deviate more from the ESI mass of 11,660 Da. Following this method, one can list all the possible formulas until the limiting case of 11,660 Da consisting of all gold atoms, which is the upper limiting case since a certain number of thiolate ligands must be present to protect the metal core. By comparing the candidate formulas with the ESI-MS-determined precise mass of 11,660 Da, we readily obtain the Au39(SC2H4Ph)29 formula (calculated FW = 11661; deviation, 1 Da), as reflected in Table 1. Similarly, the cluster of 11,993 Da is determined to be Au40(SC2H4Ph)30 (calculated FW = 11,995; deviation, 2 Da). A deviation of 0.5 to 2 Da is reasonable at this high mass range. The attainment of two new nanoclusters, Au39(SC2H4Ph)29 and Au40(SC2H4Ph)30, demonstrates the feasibility of controlling cluster size via controlled reduction. Herein, we discuss some insights obtained regarding the synthetic processes of Au20, Au24, and Au39/40. These four cluster species belong to a new series, as Au20 and Au24 are formed concurrently, albeit in small amounts, in the synthesis of Au39/40 nanoclusters. However, by controlling the reaction process, one may selectively produce Au20, Au24, or Au39/40. When using Au(III) as the starting material for nanocluster synthesis, two primary stages include (a) the reduction of Au(III) to Au(I) by HSR and (b) the conversion of Au(I) to Au n (SR) m clusters by reduction with NaBH4. Factors that are important for Au n size control with n = 20, 24, 39 and 40 include (a) the stirring speed of the reaction mixture, (b) the addition speed of NaBH4, and (c) the amount of NaBH4 added (vide infra). We found the stirring speed is quite important for controlling the size and monodispersity of gold clusters. As listed in Table 2, during stage I, the stationary condition favors the formation of Au20(SR)16 nanoclusters, while slow stirring (50 to 100 rpm) favors the formation of Au24(SR)20, Au39(SR)29, and Au40(SR)30. During stage II (the reduction of Au(I) by NaBH4), the stirring speed is even critical for the selective formation of Au20, Au24, or Au39/40. A slow stirring (approximately 50 rpm) during stage II favors the formation of Au20(SC2H4Ph)16, while a slightly higher speed of stirring (approximately 100 rpm) favored the formation of Au24(SC2H4Ph)20, and with further increased speed to approximately 400 rpm, we obtained new clusters of Au39(SC2H4Ph)29 and Au40(SC2H4Ph)30. This controlled reaction process for tuning cluster size is quite interesting. We believe that the aggregated Au(I)SR species are broken into small fragments upon reduction or partial reduction by NaBH4. Different stirring speed for stage II would influence the kinetics of the reduction reaction of Au(I)SR, and the different stirring speeds also give rise to different sheering forces that would break polymeric Au(I)SR into different sized fragments; such different sized fragments seem to subsequently grow into different sized clusters based upon our results. Regarding the aggregated Au(I)SC2H4Ph species in the solution, structural characterization (e.g., by NMR or X-ray diffraction) is still difficult to carry out as the Au(I) intermediate species is poorly soluble in common solvents. Thermal gravimetric analysis determined the composition of Au(I):SR to be 1:1, but the aggregation degree (e.g., how many repeat units in [Au(I)SC2H4Ph] x ) and what structures [Au(I)SC2H4Ph] x may adopt are all unknown yet. Possible structures of [Au(I)SC2H4Ph] x include linear chains, ring [53–57], or lamellar structures. The characterization of Au(I)SR still need major efforts in future work. In addition to the stirring speed during stage II, the addition speed of NaBH4 (aqueous solution) to reduce Au(I) into clusters also plays an important role in controlling the final cluster size. We have tested that, in the synthesis of Au20(SC2H4Ph)16, if the initial drops of NaBH4 solution (0.44 mol/L, 1 mL) were added rapidly, the light yellow solution of Au(I) aggregates would rapidly become brown or deep black, and the product would contain more Au24 and Au39/40 clusters, instead of the predominant Au20 as the case of very slow addition of NaBH4 (over a period of approximately 30 min) (entry 1, Table 2). After optimization, we found that adding NaBH4 (0.44 mol/L, 1 mL, same concentration and amount as the Au20 synthesis) over a period of approximately 15 min gave rise to predominant Au24 (under approximately 100 rpm stirring condition) or Au39/40 (under approximately 400 rpm stirring condition); see entries 2 and 3 of Table 2. Thus, controlled reduction of Au(I) is very important for size selective formation of Au20, Au24, or Au39/40. The selective formation of Au39/40 over Au24 - which differ only in the stirring speed during stage II (i.e., 400 vs 100 rpm, Table 2) - should be due to the different reaction kinetics in the reduction process of Au(I) species into clusters. In a recent synthetical work on gold/phosphine nanocluster synthesis, Pettibone and Hudgens identified a growth-etching cyclic process that occurs around the most stable cluster species to form monodisperse product [4, 58, 59]. This size selective growth mechanism provides important information on the gold/phosphine system. The reaction kinetics of the gold/thiol system, however, still needs significant input in order to unravel the details of the kinetic process. Mass spectrometric monitoring of the reaction intermediates would provide valuable information and should be pursued in future work. With respect to the growth of Au20, Au24, and Au39/40 nanoclusters, an interesting question arises naturally: why the ubiquitous Au25 nanocluster is not formed under these conditions (entries 1 to 3, Table 2). The synthesis of Au25(SC2H4Ph)18 is typically done under experimental conditions of fast stirring and rapid reduction of Au(I) with large excess of NaBH4 (approximately 10 equivalents (eq) of NaBH4 per mole of gold). An important difference lies in that the syntheses of Au20, Au24, and Au39/40 clusters all involve 1 eq of NaBH4 per gold, i.e., 1 mL of NaBH4 solution (0.44 mol/L), Table 2. This implies that the degree of reduction of Au(I) might affect the cluster size, and the formation of Au25 clusters might necessitate over reduction of Au(I) with a large excess of NaBH4. To find out whether the reduction degree of Au(I) species affect the final cluster size, we adopt the same stirring conditions as the synthesis of Au24 and Au39/40 (see entry 4, Table 2), but we add more NaBH4 (e.g., 5 eq, rather than 1 eq for the synthesis of Au24 and Au39/40). The addition speed of NaBH4 solution is kept comparable to the syntheses of Au24 and Au39/40 clusters. Interestingly, dropwise addition of 5 eq of NaBH4 does result in selective formation of Au25, instead of Au24 or Au39/40, evidenced by its characteristic spectroscopic features (see Figure S2 in Additional file 1). Thus, the growth of Au25 nanoclusters does require a rich reductant (NaBH4), as opposed to lean NaBH4 for Au20, Au24, and Au39/40 synthesis. The fast stirring and rapid addition of NaBH4 seem not the key to the synthesis of Au25 nanoclusters. This work has demonstrated the effectiveness of controlled reduction for synthesizing different sized gold nanoclusters. Specifically, slow stirring and slow addition of 1 eq NaBH4/mol of gold are critical to effect the preferential growth of the series of Au20, Au24, and Au39/40 nanoclusters. In addition to the reaction kinetics, controlling the degree of reduction also leads to different sized nanoclusters, as demonstrated in the selective formation of Au25 over Au n (n = 20, 24, 39/40). Future work is hoped to offer deeper mechanistic understanding of the Au(I) formation and the Au(I) reduction process by NaBH4. Mechanistic understanding of the cluster growth process will eventually permit high yielding synthesis of a full series of monodisperse gold nanoclusters. XM is presently working at Anhui University (China). He received his PhD in Chemistry from the University of Science and Technology of China in 2007. His research interest focuses on chemosensors. ZL is a graduate student in the Zhu group at Anhui University (China). He obtained his BS in Chemistry (2010) from Anhui University. His research interest is noble metal nanoparticles. MZ presently works at Anhui University (China). He received his PhD in Chemistry from the University of Science and Technology of China in 2000. Before joining the Jin group as a postdoctoral researcher in February 2007, he worked at the University of Science and Technology of China. His research interests focus on photoinduced electron transfer, sensors, and nanomaterials. RJ received his BS in Chemical Physics from the University of Science and Technology of China (Hefei, China) in 1995, MS in Physical Chemistry/Catalysis from Dalian Institute of Chemical Physics (Dalian, China) in 1998, and PhD in Chemistry from Northwestern University (Evanston, Illinois) in 2003. After 3 years of postdoctoral research at the University of Chicago (Illinois), he joined the Chemistry faculty of Carnegie Mellon University in September 2006. His current research interests focus on atomically precise noble metal nanoparticles, evolution of their structure, electronic and optical properties, and utilizing these well-defined nanoparticles in catalysis, optics, sensing, and so forth. Manzhou Zhu acknowledges financial support by NSFC (20871112, 21072001), 211 Project of Anhui University. Rongchao Jin acknowledges the support by the Air Force Office of Scientific Research under AFOSR award no. FA9550-11-1-9999 (FA9550-11-1-0147). XM and ZL participated in all the studies and in writing this paper. MZ and RJ supervised in the concept of the study and participated in its design and in the revision of the manuscript. All authors read and approved the final manuscript.